The junior gigolo from Hung is the new Green Arrow! 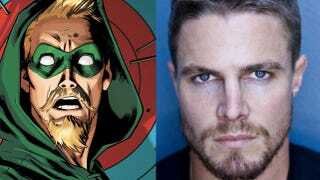 CW is gearing up for their new Green Arrow live-action TV series, as they've already cast their main character, the arrow-shooting, millionaire vigilante Oliver Queen. According to Deadline, Stephen Amell will be our new Green Arrow (sorry, Smallville's Justin Hartley). An earlier casting call revealed that Queen is a 27-year-old "reformed bad boy" who turned into a different man after he spent five years shipwrecked on a dangerous island. Now that he's returned, Queen wants to make a difference in his hometown, Star City. Best known for his work as the new-prostitute-in-town on Hung, Amell certainly looks like he can fill the part. But will this future Mayor of Star City be channeling a script written in the cheesy Smallville style? Only time will tell. The pilot will be written and produced by Andrew Kreisberg, Greg Berlanti and Marc Guggenheim.